"Return" in the title tells us someone or something must have departed or gone elsewhere; this time it was all three brothers from the same family, though the narrative focuses mostly on David, who returns to his Amish community of origin after staying away for a year. For David [page 182 among many other pages and paragraphs] home is what he refers to as *his* church community; home includes smells and scents of food and sod and manure, human voices, touches, the sound of hymns, the savor and taste of simple plain traditional farmhouse food, the sight of wooden farmhouses and barns, the expanse of farmland. Return to Paradise narrates a few weeks in the lives, and helps the reader began to comprehend the inward pull – also the outward push – of a community that keeps mostly to itself, doesn't attempt or aim to assimilate with the larger society, yet whose lifestyle exemplifies Christian in its love and regard for neighbor, its deference to the Divine. This isn't a page turner in the conventional sense, but I found myself actively wondering what would happen next; almost(!) surprised at discovering again the essential human need for love, affirmation, and inclusion, pain over exclusion and misunderstanding, at the relational difficulties and stresses that are anything but unique to those of us who spend most of our time and labor in more mainstream society, in expressions of Christianity that more fully engage world and culture. Close to the book's conclusion on page 204, Lavina (who's at first David's girlfriend, later his fiancée} reminds us "God's got a plan for us ... I figure it's a lot like this road. We can see just a little ahead but not all the way home. But maybe all we need is to see just a little ahead. I mean, we have to trust." 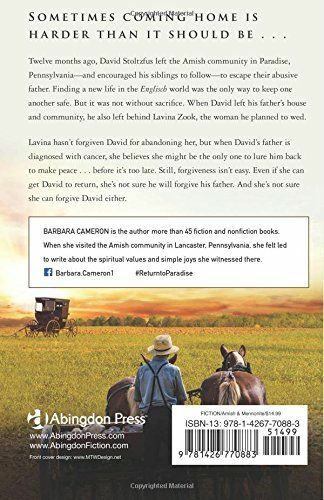 This is the third of Barbara Cameron's novels about an imaginary Amish (Pennsylvania Dutch, or Deutsch) community in Lancaster County, Pennsylvania I've read; I've enjoyed learning a little about the overall lifestyle, values, and types of interactions Amish sometimes have with the outside Englisch folk. More than one state of the USA has a village or town named Paradise; wikipedia tells us Paradise, PA, "is a census-designated place in Lancaster County, Pennsylvania, United States with a zip code of 17562. The population was 1,129 at the 2010 census." Cameron reminds us Amish Ordnung's rules and regs aren't one size fits all, with Amish in Lancaster county intermingling considerably more than might happen elsewhere. 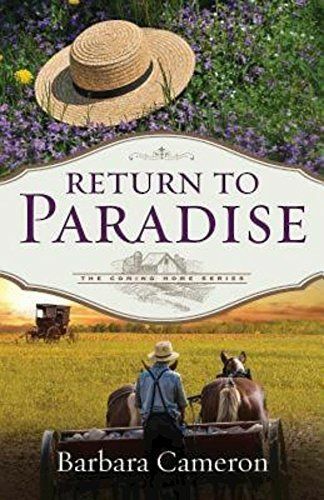 I'm looking forward to the next book in this new Coming Home series; the several-pages long teaser in the back of Return to Paradise provided a look into the start of main characters David's and Lavina's marriage. Even if I hadn't read Cameron's previous books, even if I weren't interested in learning more about other Christian groups, the lovely cover painting would induce me to check out the inside content. ...maybe all we need is to see just a little ahead. I mean, we have to trust.